Tankless Water Heaters are quickly becoming a popular alternative to old, clunky hot water tanks. 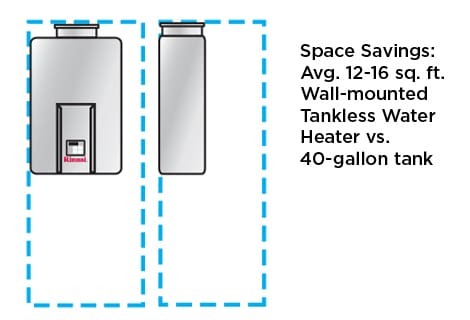 We get a lot of questions about these units, so we decided to share a little information about how tankless units are superior to their less-efficient counterparts. Traditional hot water tanks are a huge waste of energy. After all, its not very efficient to keep 40+ gallons of water hot all day, every day, regardless of whether or not you’re using it. And its not just energy wasted, its money too. Tankless water heaters reduce energy/fuel use and save you money by only running when you need hot water. Never run out of hot water again! If you have a large bathtub, teenagers living in your home, or just like to take long showers, you know how frustrating it can be to run out of hot water. With a tankless water heater, you get infinite hot water on demand. And tankless units come in a variety of sizes and models, so if you need hot water running out of every faucet and shower head in your house at once, we have models that can handle it! Get that big clunky tank out of your closet! Tankless water heaters are 3 to 5 times smaller than traditional hot water tanks, so you can take back that closet in the laundry room! And since tankless units are completely closed systems, you never have to worry about a pilot light being blown out or exhaust gases leaking into your house. Drink, cook, and bathe with cleaner water! 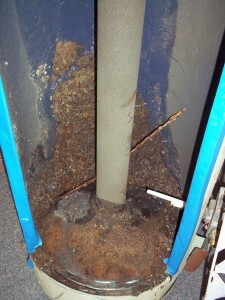 Traditional hot water tanks are infamously hard to clean and descale, and they can significantly lower water quality. Tankless water heaters don’t have a holding tank, and so the amount of surface area available for build-up to form is greatly reduced. Regular service of your tankless unit will keep your water supply clean and healthy, the way it should be! Rebates and tax credits! These vary depending on where you live, and what source of energy you use to heat the water in your home. All tankless water units we sell qualify for at least a $300 tax credit, and many of them also qualify for $150-200 rebates from local energy companies. Want more information? Fill out the form to the right or call our office today at 360-734-4455 and we’ll send a technician to your home to give you an estimate for upgrading to a tankless water heater and answer all your questions, at no charge!